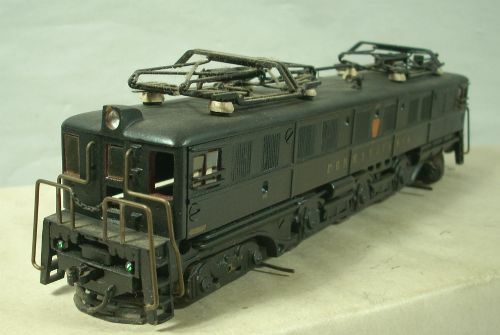 In 1934 Nason introduced a machined bronze kit to make the model of The Pennsylvania Rail Road’s P5A locomotive. The kit cost $37. I’ve had this loco for years, and it’s certainly my favorite OO loco.This is set up for outside 3rd rail, and has one large motor with field windings. 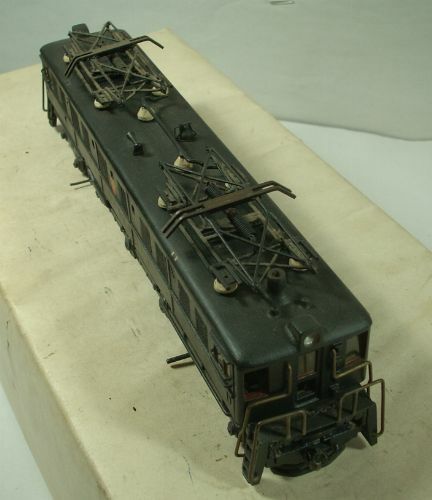 The advertisement on the American OO site for this loco says it came with 2 motors in 1935. Here’s a link to the ad. When I got this loco it was wrapped in newspaper from 1957 so I’m pretty sure this is an unmolested model. I bought this from an elderly woman who’s dad had built the layout when she was a girl in the 1930s. I have lots of OO gauge trains assembled kits, and this loco along with the other locos I got from the same seller show the best workmanship of any OO trains. A few of the pieces of window glass have fallen out over the years, and there are a few scratches that allow the bronze casing to show through, but otherwise this is in wonderful shape. I think this engine was made between 1934 and 1940. Nason was in New Rochelle NY. Here’s a bit of history on Nason.